Frustrated when your baby doesn’t fall asleep on his own? 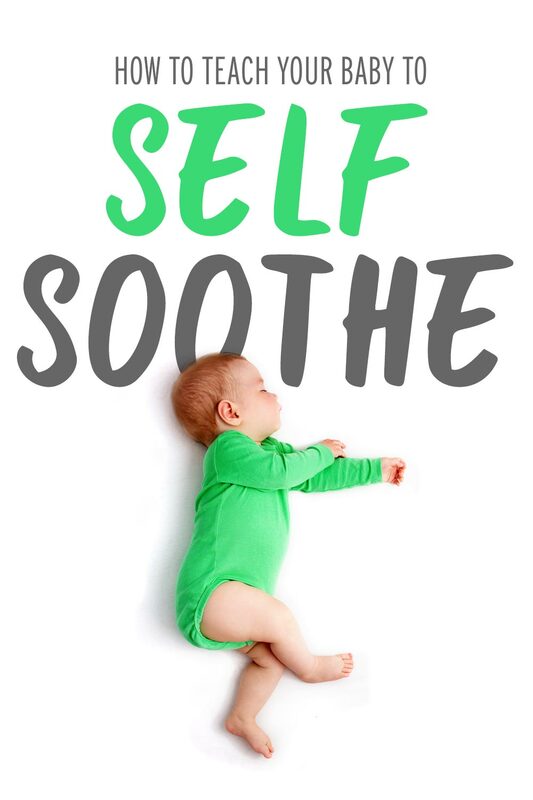 Learn how to teach self soothing techniques for babies to sleep with these effective tips. My six-month-old son was fast outgrowing many of the sleep gear my husband and I had been relying on to help him sleep. The swaddle—even in extra-large—wouldn’t stay on all night. He looked squished in the swing and was getting way too heavy for me to rock in my arms, even while bouncing him on a yoga ball. This didn’t even include the exhaustion of nursing him throughout the night—the one surefire way he’d fall asleep. I had an inkling that at this age, my baby was waking to nurse more out of habit (and as a way to fall asleep) than actual hunger. One thing was clear: he was well past the newborn stage and had outgrown all the ways that used to help him sleep. For most of us, the newborn stage is a jolting introduction to parenthood. No past experience with sleep deprivation can compare to the exhaustion that comes with caring for a newborn round the clock (especially at night). We bounce between feeling inexplicable joy and wonder all the way to frustration and even resentment. Still, the newborn stage is, in many ways, an “easy” stage to get through. As difficult as these weeks and months can be, it’s also easier to accept its hardships. We’re prepared for sleepless nights and anticipate a huge change to our lifestyles. We also understand that newborns are still so new to our world and dependent on us. They need help falling asleep and have tiny tummies that require them to eat frequently. They can barely tell the difference between night and day, making us more forgiving for the many times they won’t sleep in long stretches when we want them to. The newborn stage is also when we’re more likely to use baby gear or tactics to help them fall asleep—we’ve got swaddles, pacifiers, swings, baby wraps, you name it. We’re in “survival mode” and do whatever it takes to stay sane and get any sleep. The problem is, after this stage, we soon realize that the baby gear and tactics aren’t sustainable. The pacifier keeps falling out, the swaddle is getting too small, the baby is getting too heavy to rock. No matter how effective these sleep aids once were, they don’t help babies fall—and stay—asleep on their own. 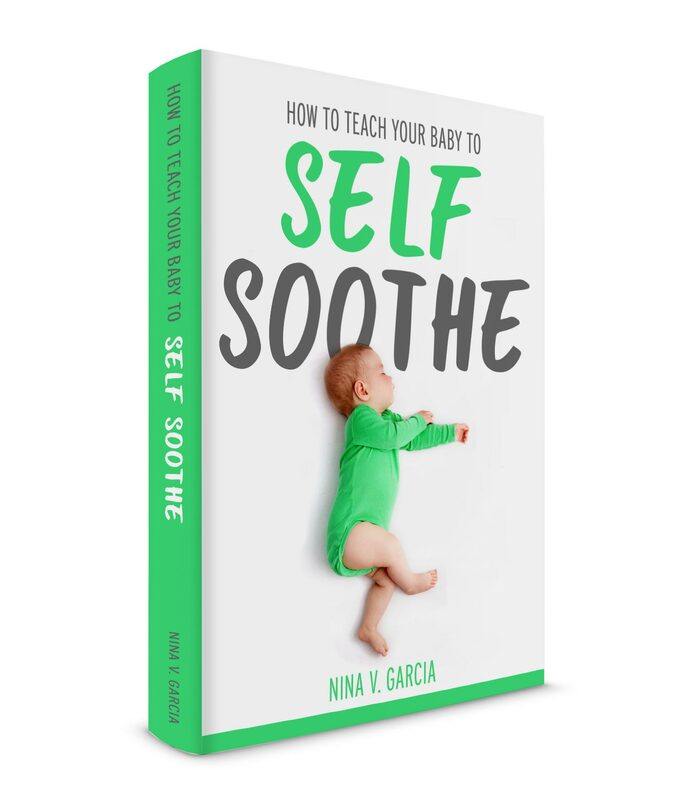 My passion has always been to help overwhelmed moms and dads enjoy parenthood, and my ebook, How to Teach Your Baby to Self Soothe, is yet another example of that mission. Because it’s hard to find joy when you feel sleep-deprived, frustrated, even resentful. 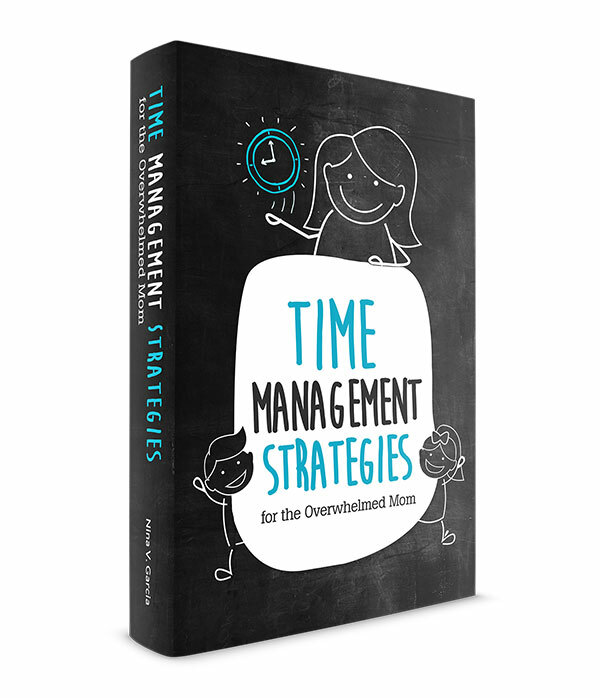 My goal with this guide is to help you and your family get the sleep you need to enjoy parenthood the way you always imagined. And if you’re reading this, I’m sure you can relate to many of the struggles I too faced with putting my baby to sleep. Perhaps your baby isn’t self soothing in a way that allows him to consistently fall and stay asleep on his own. He needs the pacifier and wakes up crying for you to put it back in his mouth. He won’t sleep in the crib, and instead prefers the bassinet, swing, or even you. And you have a feeling he’s not really waking up to feed because he’s hungry, but rather because he’s grown used to nursing or sucking. Rest assured that the optimal sleep solution is possible. As farfetched as it may seem, your baby can sleep through the night. In fact, I encourage you to make a “wish list” for your ideal sleep situation. Don’t edit things out as “unrealistic” or doubt whether it’s possible. Simply make a list of your ideal sleep situation, the way you’d love for your baby to fall asleep. Considering that my son was doing pretty much the opposite, it seemed like an impossible dream. But after a few nights, he followed everything on that list. He went from swaddled, rocked, nursed, and waking up at least twice a night, to falling asleep in his crib after being put down awake and unswaddled, for a solid 11-12 hours straight. And guess what? The same can happen for you. “THANKS SOOO MUCH! Before reading your book, I was rubbing my daughter’s back for an hour until she was completely asleep. But then she’d wake up in another 2-3 hours, and I’d have to rub her back again or nurse. She’d do this 3-4 times a night! I was so sleep deprived, I thought I’d just have to get used to it, that my baby will never be a good sleeper. I even hired a sleep consultant—money wasted! The process with the sleep consultant discouraged me even more. I found your book and liked the part about the mindset and that my baby won’t hate me the next day. She cried the 1st night, on the 2nd night she cried two minutes, but by the 3rd night, she didn’t cry at all! It’s been 2 weeks since applying your book, and she goes to sleep without any tears and wakes up happy, I can’t believe it! Your book encouraged me to deal with a little crying and know that my baby can do it, and she does! It teaches you how to help your baby sleep in a kind way. Thanks a lot sincerely.” -Diana D.
You’ve heard it so many times before: “Every baby is unique.” You hear it about milestones and temperaments, and I’ll say the same about when a baby can start self soothing and falling asleep on his own. Each baby is different, and the best way to know whether yours is ready to sleep through the night is to ask his pediatrician. She can let you know, based on your baby’s unique circumstances, whether he’s ready to start self soothing. But generally, the younger the baby, the more dependent he is on you for everything… including falling asleep. Because of that, How to Teach your Baby to Self Soothe is catered to parents of older infants. Your baby should be past the newborn stage and can physically sleep through the night without waking up to feed. Again, the best way to know he doesn’t need middle-of-the-night feedings and can start self soothing is to double-check with his pediatrician. I applied the bulk of these self soothing methods when my eldest was six months old, and a few years later, when my twins were four months old. These ages were unique to them, and many factors led to that decision. If your baby is still too young, hold off for now and apply these methods when he’s able to. Ready to get the sleep you and your baby need? 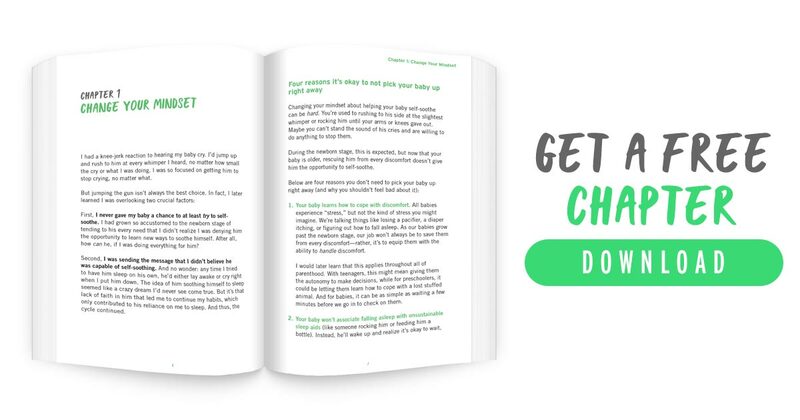 I’ve been doing this for over eight years and have helped thousands of parents, and this is what I can tell you: Getting your baby to sleep through the night is a game-changer, the turning point to get life back to normal again.